Size (inches): 10.43" X 3.46" X 1.38"
Available in 6 attractive styles, this 9" plastic hair brush features a comfortable curved handle with a textured grip and 74 clusters of plain-tipped, flexible plastic pins, enamel-dipped to facilitate smooth brushing. Colors include pink, purple, or green, and individual color selection cannot be guaranteed. 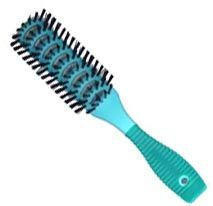 This series of brushes includes roller, square, and round brushes in pink, green, and purple.